What is life about? We can really wax philosophical about it, or just simply say it’s all about taking risk. Our first tenuous steps – risk. Our first bicycle ride – danger. Our first time on ice skates – peril. Our first time asking someone for a date – big risk! So I think I’ve made my point. We are all about risk taking. But why do so many business owners feel that if they don’t make a decision, there is no risk? Let me say that another way. There is risk in every decision we make, including not making a decision. 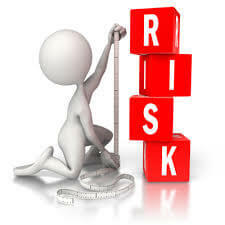 In fact, it may be riskier not to make a decision than making one. Let’s take this example. Your business is stagnant; which means you are losing ground; which means you are ultimately going to go out of business. Decision matrix time; make a change which is out of your comfort zone (which isn’t working) or try something new. Negative Risk factors: Do nothing; go out of business. Do something; go out of business. Positive Risk factors: Do nothing; none. Do something; stay in business and grow. Previous Post: Ever have an Embezzlement Susceptibility Probe?